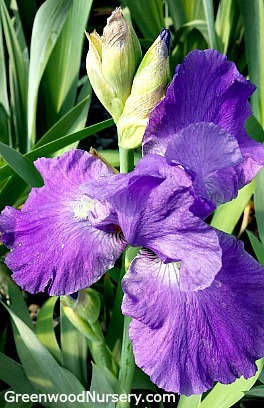 Tall Bearded Irises are the spring flowering staple for gardens. This purple flowering perennial is a dependable re-bloomer from spring to early summer. Strong stems are topped with blue-violet flowers with yellow beards and lightly ruffled petals. Plant this purple iris near outdoor sitting areas to take advantage of its sweet fragrance. The Feed Back Iris is a tall bearded iris and will flower most in full sun. Does not tolerate wet feet or continually wet/damp areas as it causes root rot. Plant bearded irises in well drained soil. This purple iris grows up to 36 inches tall with a spread of 12 to 18 inches wide. Plant 14 to 16 inches apart to keep good circulation. Companion plants for iris are other irises such as the Harvest of Memories Yellow Iris. Plant 14 to 16 inches apart to keep good circulation. Rhizomes should only be lightly covered by soil at 1 to 2 inches deep to prevent rot. Fertilize 3 times each year - when new growth appears, after blooming and in fall. Recommended fertilize is one with no nitrogen or 0-10-10 to work into soil. As with daylilies, be sure to divide your irises every 3rd year to keep them looking their best. Dig up clump and using a sharp knife, cut the rhizomes apart. Keep the newer around the outer edge and discard old woody centers. Feed Back Purple Iris is grown in a one gallon container. Orders shipping to CA and AZ will be bare rooted before being prepped for shipping.